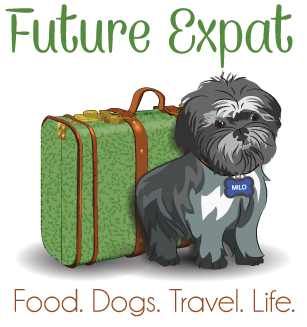 Planning international trips is almost as much fun as going on them. But some of the logistics are harder to sort out than others. Figuring out how to get from one place to another is the one area that I find the most challenging. 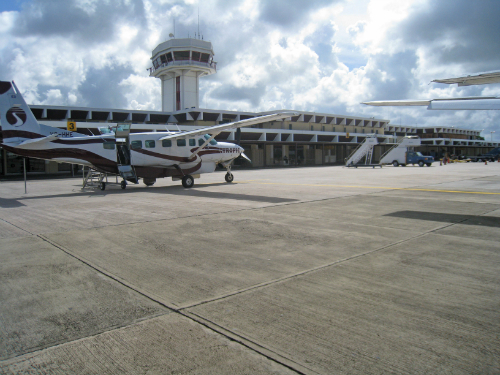 Here’s a rundown on how we got around in Belize. 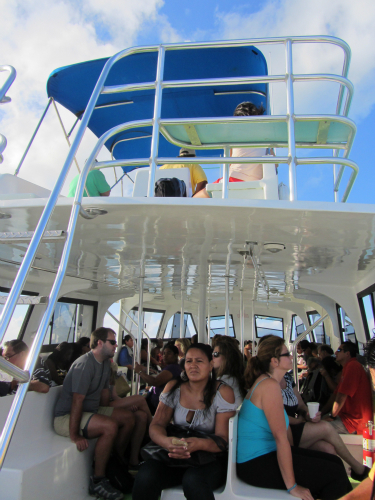 We had the choice of either taking a bus or a water taxi to cross the border from Mexico to Belize. We were a little concerned about the high crime rate in Belize City and traveling by bus just didn’t feel as safe. 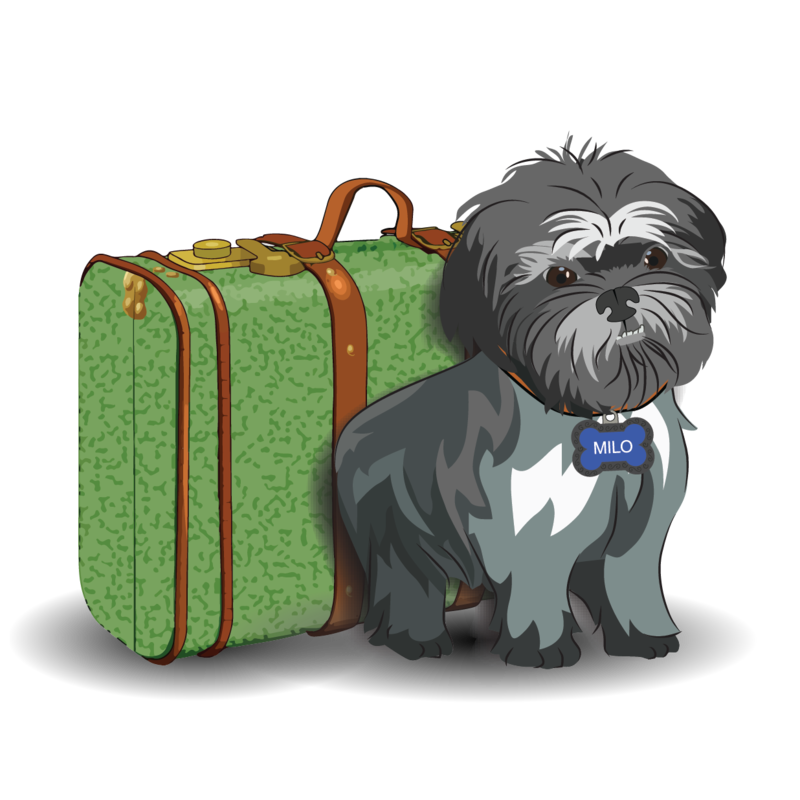 We also read that you have to get off the bus at the border to go through customs and if it takes too long, there is no guarantee that the bus won’t leave without you. 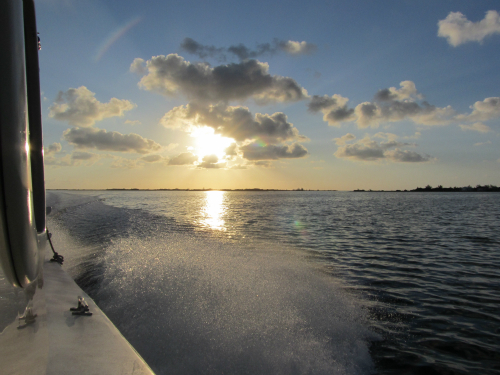 Plus…I can never resist a boat ride. So there really was no choice. We booked a ride on the San Pedro Water Taxi. The cabin felt like a small plane with seats in an enclosed cabin and open doorways that allowed you to see out and enjoy the breeze. 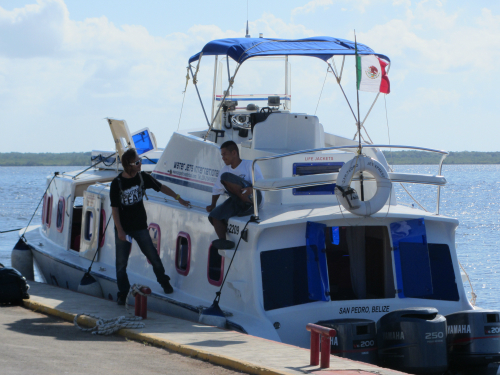 While I’ve ridden on boats big and small before, I’ve never used a boat to cross a border before. 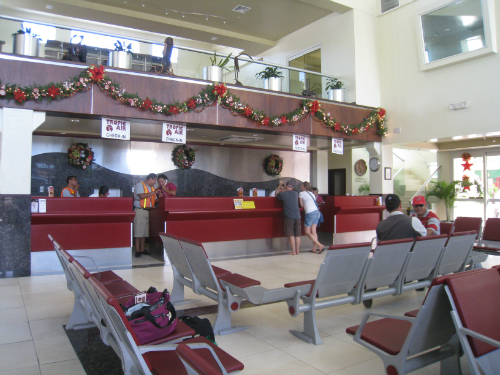 Checking in at the water taxi terminal, we had to pull out our passports and fill out customs paperwork. We handed over our luggage, then took a walk to the end of the pier where we waited with everyone else for departure time. 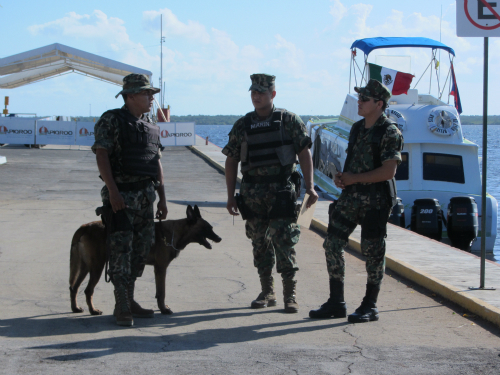 A few minutes later, a military truck with soldiers carrying guns drove down to the boat. Moments later, a cart carrying all of the luggage was pushed down the pier and the bags were laid out in a line. The soldiers climbed off the truck and brought over drug sniffing dogs to check out our stuff. And us…as we were only standing about 3 feet from our bags. Luckily everyone passed the test and we were on our way soon. The ride was great. 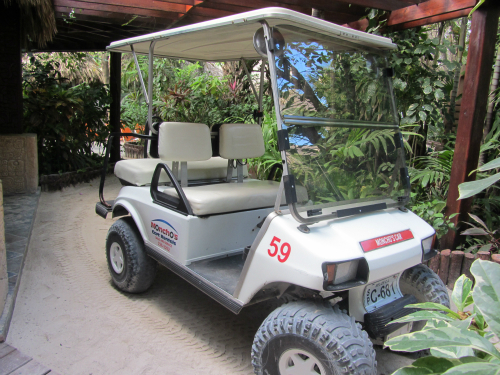 It was a lot faster than traveling by land and we were dropped off just blocks from our hotel resort. When we arrived, the people at the terminal called Ramon’s Village Resort for us and a few minutes later a friendly guy in a golf cart was ready to take us on a 2 block ride to the hotel. 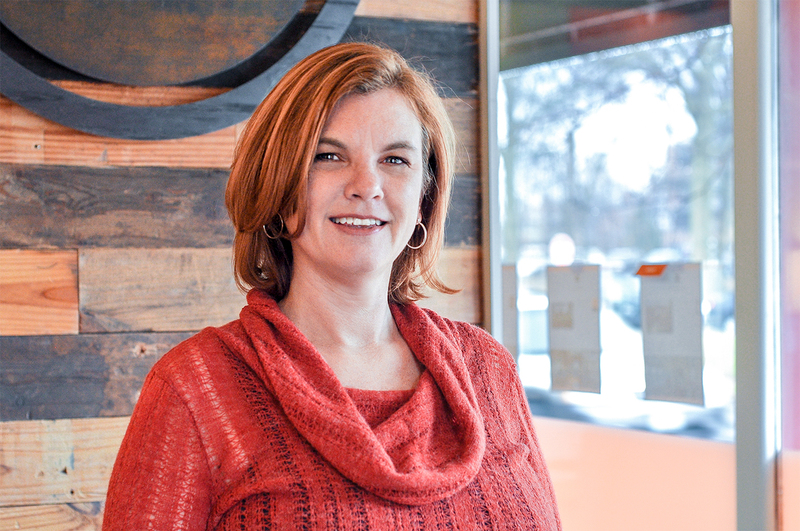 One of the reasons that we chose Ramon’s Village was because it was located just a couple of blocks from downtown. We were able to walk down the beach or street to get almost everywhere. The airport was less than a block away, so we could have even walked to the airport if we wouldn’t have had to drag the suitcases through the sand paths of Ramon’s Village (they supplied a golf cart shuttle for us when we were ready to leave). The one day that we wanted to explore beyond downtown, we rented a golf cart. It allowed us to see everything we wanted to see in a leisurely pace. Most of the residents were driving golf carts instead of cars too. We only rode in one vehicle on the island. 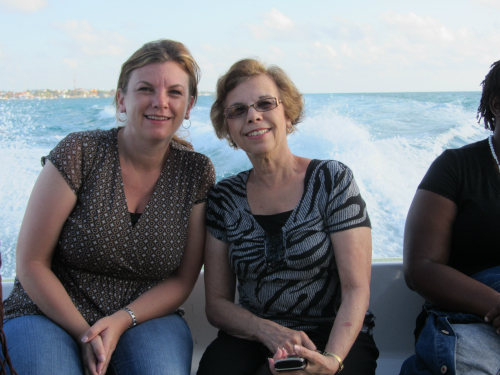 The night we went to dinner in the south side of the island, we took a mini-van taxi ride. People staying in the more remote resorts on the island or who lived on the island seemed to travel by bike, but we didn’t need them during our stay. We had to get to the mainland twice during the trip. There are just 2 options. Take a boat or fly. The day when we met Father Stochl for a tour of the prison, we took the water taxi. The early morning boat ride was filled with lots of locals heading to work and school along with some other tourists like us. The boat was what expected, holding plenty of people on 2 levels. 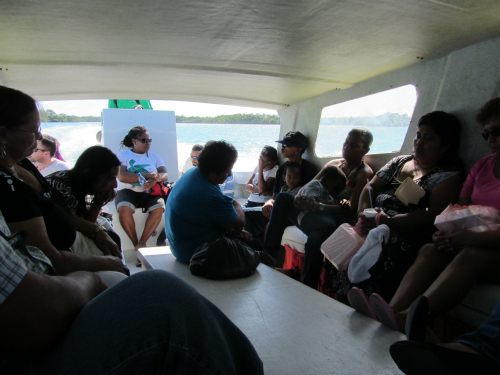 The ride back was on a much smaller boat clearly filled with locals on their daily commute or shopping excursion (everything is cheaper on the mainland than on the island). 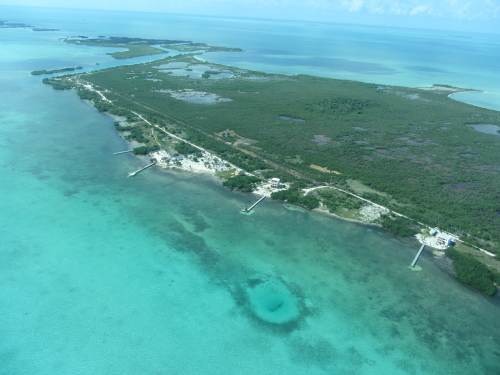 While we could have taken the water taxi and then a regular taxi to the airport when it was time to head home, it was faster and almost the same cost to fly from the San Pedro airport to the Belize International Airport. 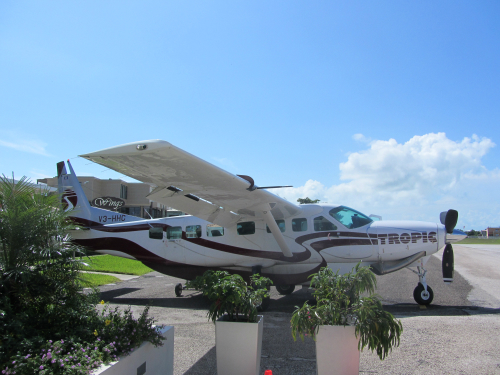 I’m really glad we did, because the flight on the 12 seat Tropic Air plane was just plain fun. The airport security was non-existent. Not a single person asked to see our IDs. 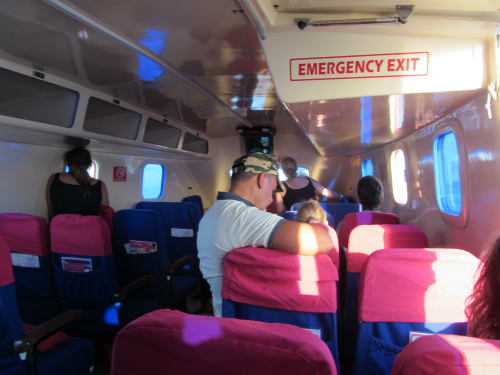 When we were ready to depart, the pilot announced that the flight time to our stop in Caye Caulker was 6 minutes. 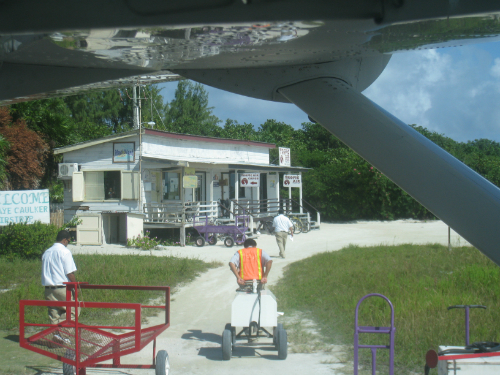 We landed and rolled to a stop next to the shack of a terminal. One man rolled over a set of stairs and another was waiting with a golf cart taxi for the 2 passengers that got off. They weren’t even in the golf cart parked about 30 feet away when the plane started rolling again. We did a u-turn on the runway and took off. From take off in San Pedro until landing at the international airport, including the stop, took only 20 minutes. With such a short flight, we were flying low enough to see the fish swimming below up. It was amazing. The golf cart, boats and small plane were definitely part of what made this trip unique. I will definitely keep it in mind the next time I plan a trip.